Mooch Gives POTUS Advice on How to Lose WH: Adopt Morning Joe’s ‘Moderate’ Playbook! Disgraced former White House communications director Anthony Scaramucci again attempted to endanger and sabotage President Donald Trump’s reelection chances by insisting that Trump adopt Morning Joe Scarborough’s “No Labels” playbook even though statistical evidence suggests that such a strategy would guarantee Trump loses in 2020. Perhaps that is what Scaramucci, like Scarborough, ultimately wants. On ABC’s This Week on Sunday, Scaramucci said Trump has “got to be more into where the moderates and the independents are.” He repeated the same advice on Monday evening on Stephen Colbert’s Late Show. A recent study, though, found that only 3.8% of voters in 2016 were the so-called “economically conservative and socially liberal” voters Morning Joe panelists–mistakenly thinking that Americans are exactly like the New York and D.C. elite with whom they eat foods and drink beverages that are not found on the dinner tables of most Americans–salivate over endlessly. Yet, Scaramucci insisted that Trump will be “very successful” by adopting Scaramucci and Scarborough’s “moderate” positions favored by the global elites from whom they have always craved affirmation. 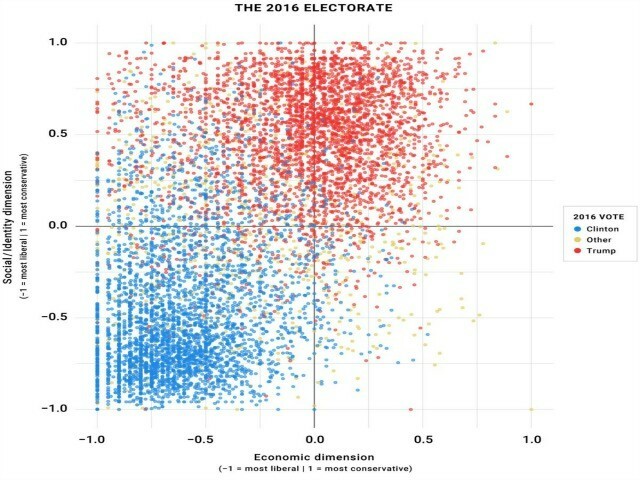 As the Wall Street Journal, of all places, pointed out, the Voter Study Group study found that only 3.8% of voters in the 2016 election were “socially liberal and economically conservative,” and they “split their votes evenly between” Trump and Hillary Clinton. As Breitbart News has pointed out, it seems like Trump’s advisers in the White House either want him to adopt socially liberal policies that will turn off Trump’s conservative voters or rigid economic policies that benefit Wall Street, which would turn off Trump’s blue-collar voters in the Rust Belt states. Former White House Chief of Staff Reince Priebus pointed out that Bannon works tirelessly for the pro-nationalist and populist agenda that put Trump in the White House. “He is a brilliant guy who only cares about the president’s agenda. He thinks about it 24 hours a day. Never quits,” Priebus said. The question is now whether White House Chief of Staff John Kelly will allow Bannon to present Trump the viewpoints that will be essential to keeping him in office or side with those in the White House who have never understood Trump’s appeal, which will ensure Trump loses the 2020 election and cause Trump’s haters in the legacy media and the Never Trump world to rejoice.